Welcome to my blog, in this space I will share recipes, cooking tips, pantry ideas, kitchen gadget must haves and much more...I am making it a goal to become a better cook and hopefully can help my followers see cooking is not as hard as you think... no I am not Julia just Julie...... Stay tuned to The Year of the Cook! mother. wife. friend. daughter. sister. dog watcher. cook. entertainer. party planner. house cleaner. errand runner. photographer. gardener. sports fan. board game inventor. stadium builder. traveler. basement gym junkie. magazine & book reader. and always me. The Year of The Cook has been going strong for a FULL YEAR!!!! It has been a great experience. Thank you Rachel for inspiring me and thank you Dave for being patient and supportive throughout the Year. While I could just close the book on the blog, I have had a lot of people plead that I keep it going. So while I may take a break here and there...or maybe reinvent the blog...I will hang in there for now. It has been fun to hear from people who have made some of these recipes, or contributed some of their own....thanks to all of you.. 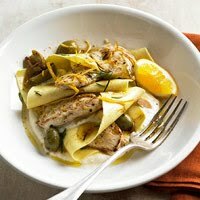 Lemon and chicken create a perfect combination of flavor. Lemon is a great addition frankly to most dishes. Everyone needs recipes for chicken and this one is fast and delicious. In a large stock pot, bring 3 inches of water to a boil and add noddles and 1 tsp olive oil. Cover and cook 6 minutes or until tender, drain. Lay noodles on a single layer of wax paper, cover and set aside. Zest the lemon and set zest aside. Cut the lemon in half and cut one of the halves into wedges and juice the other half. Sprinkle the chicken with half the lemon zest and season with salt and pepper. In a large saute pan heat 1 tbl olive oil, and add chicken to the pan. Cook about 10 minutes, turning once until the chicken is no longer pink. Add olives and heat through. In a bowl combine lemon juice, ricotta cheese, 1/2 tsp salt and 1/2 tsp pepper. Place bowl in a microwave and heat for 30 seconds. Spoon ricotta mixture into four bowls, top with noodles, then chicken and olives. Garnish with remaining lemon zest, wedges and rosemary and serve. 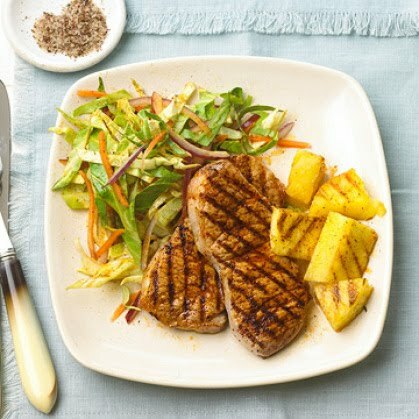 Pork...sometimes very unforgiving....overcooks in seconds....but we all love good pork chops, tenderloin, ribs..you name it! The secret is to brine pork like we have all learned to do with our Thanksgiving turkey. Simple, salt, sugar, some citrus like orange or lemon, fresh herbs like rosemary and thyme and of course pepper...covered in water for hours or overnight. So after hours of brining..here is a great recipe for pork chops. with 2 tbl marmalade and grill 3-5 minutes more turning once. Pork should be slightly pink and 160 degrees in the center. In a bowl combine yogurt and 1 tbl marmalade and a pinch of pepper. Spoon this mixture over chops and pineapple and sprinkle with nuts. Just delicious! 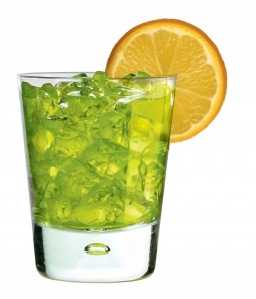 This is a margarita-style drink using melon flavored vodka. SKYY has a melon flavored vodka as do many other brands...you choose. This is a great option for a fruitier drink at your St. Patrick's Day party. Pour ingredients in a cocktail shaker with ice. Shake until frothy and strain into a martini glass and garnish with lime wedge. 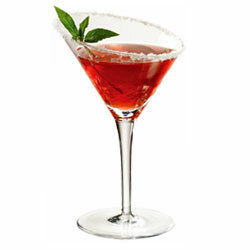 Blend ingredients in a mixer with 3/4 cup ice and serve in a salt-rimmed margarita glass and garnish with a lime wedge. 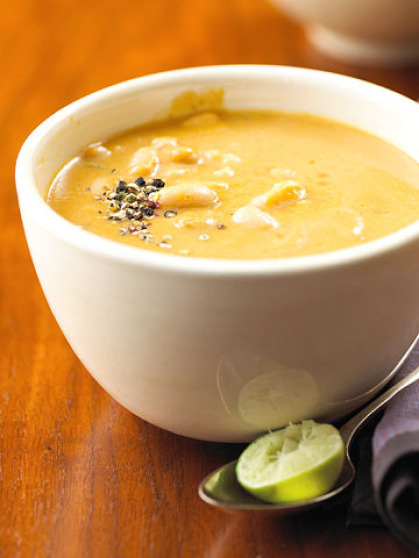 PUMPKIN BEAN SOUP - 5 INGREDIENTS! This couldn't be easier and EXACTLY what we need as the next snow storm approaches... aauugghh!!!!! Five ingredients and ready in 15 minutes. Serve with nice crusty bread or good oyster-style crackers. If you don't want to use chicken broth certainly substitute vegetable broth. Here comes the SUPER easy part. Combine first 5 ingredients in a saucepan. Heat through and until everything is combined. Taste to see if you would like a more salty taste. Sprinkle with pepper....A nice twist is to serve it with a lime wedge. DONE! 5 INGREDIENTS, 15 MINUTES - DINNER! I know I have disappointed many in the few few few desserts I have blogged. I do like ice cream and depending on the fruit preparation..I am in! So here ya go! Cut the peeled bananas on a diagonal into about 8 pieces each. In a large saute pan combine orange juice, sugar and butter. Heat about 1 minute or until butter melts and sugar dissolves. Add the bananas and cherries and cook for 3-4 minutes just until bananas are tender. Stir in nutmeg. 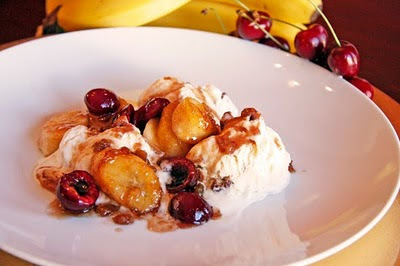 Place a BIG scoop of vanilla ice cream in a bowl and top with banana-cherry mixture. 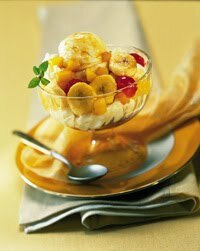 You will be a hit and these cooked fruit desserts are very elegant and people think they take a lot of effort...!!!! One thing we can all count on is apples. 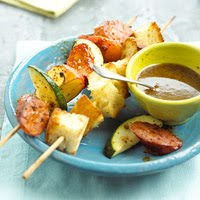 This is a great meal for kids who love apples and with this sweet marinade it's perfect. It also makes a great appetizer for your winter party. I serve it as a main course and replace the bread with rice. You can add more veggies or pineapple too. When cooking with apples be watchful which variety you choose. Cooking apples include; Braeburn, Fuji, Gala and Granny Smith, while Red Delicious are better served raw. Try to use metal skewers so they won't burn, but if you use wooden make sure you soak them for about 30 minutes in water before using. Preheat your broiler. In a bowl combine mustard and honey. On four skewers, alternately thread pieces of sausage, zucchini and apple. Leave a bit of space between pieces. Reserve some of the honey-mustard mixture. Brush remaining mixture over the skewers and place on an unheated broiler pan. Broil 4-5 minutes. Then thread bread on the remaining 4 skewers and lightly brush with oil. Add bread skewers to the broiler pan. Turn sausage skewers. Broil 3 minutes more until sausage is heated through and bread is toasted on all sides. Serve with remaining honey-mustard mixture. HOPE THE KIDS LOVE THEM! I will start this one off by saying Yes there are lots of ingredients and it takes a little time...but when you have a nice weekend day with no plans this is really a great dish to make. I made it last week and just loved it. I start with peeling and deveining the shrimp and using the shells to make a shrimp stock. If you want to avoid that step any boxed seafood stock will do...but the aroma of the shells in the broth was truly amazing. I will add the stock recipe at the end of this blog. Make basmati rice according to package direction but add 2 bay leaves and 1 tbl salt to the water. Take out bay leaves when done and place the pan with rice in a 400 degree oven with the butter on top for 15 minutes. This helps dry out the rice a bit. Set aside. Melt butter with oil in a saute pan. When butter froths add 1/2 of the onion. Cook until light golden brown. Add remaining onion, celery, green pepper and reduce heat to medium. Add 1 tbl Creole seasoning and pinch of salt. Sweat all vegetables until soft. Add tomato paste and mix well to incorporate with vegetables. Add tomatoes and stir until they start to break down. Add wine and turn to high until alcohol burns off. Add the stock, Worcestershire, garlic, bay leaves, black and white pepper, thyme (add any Tabasco or cayenne or more creole seasoning if you like). Boil then reduce heat and simmer about 30-45 minutes. Season with salt to taste. Season raw shrimp with salt and a pinch of cayenne. Bring sauce to a boil again and add shrimp. Immediately reduce heat. 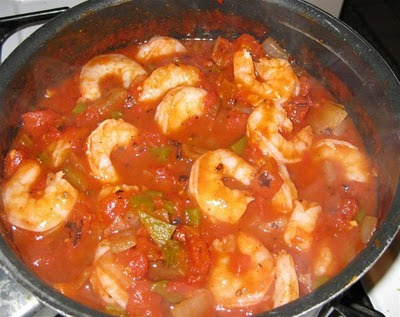 Let sauce simmer until shrimp are cooked but not overdone. Remove from heat and serve with rice. Place all ingredients in a big stock pot and cover with cold water. Bring to a quick boil and reduce the heat to simmer. Simmer 45-60 minutes. Strain through a fine mesh. Stock freeezes very well. May seem like lots of work...but is very very worth the effort. So my husband and I go to this great little Italian place by our house and always order their eggplant parmesan appetizer. 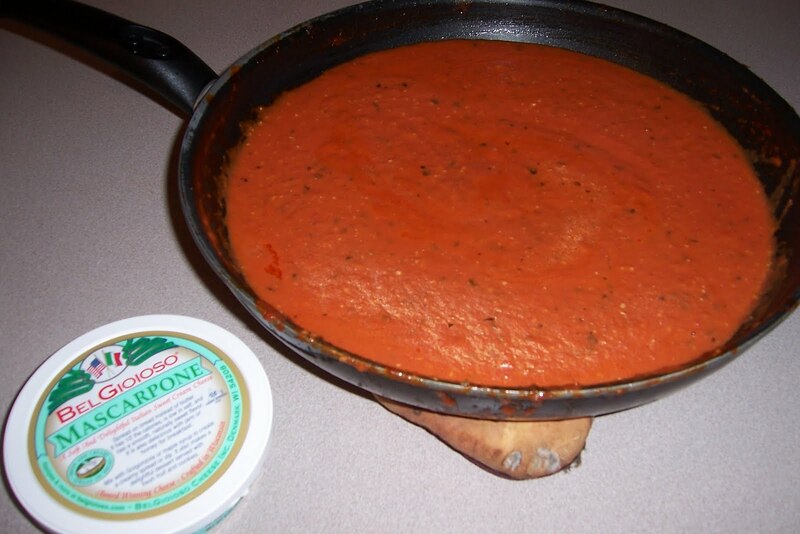 It is just a single layer of breaded eggplant with this insanely delicious sauce. I knew there was an ingredient I couldn't identify and I finally got the chef to tell me it was mascarpone cheese and using plenty of tomatoes without the extra liquid in the can. So I have experimented with measurements and here it is....just delicious! Place cherry tomatoes on a baking sheet with some olive oil, salt and pepper. Roast in the oven for 15-20 minutes until they start to blister. Heat olive oil and butter in a saute pan. Add garlic and shallot and cook until tender. Add canned and cherry tomatoes, vinegar, wine, salt, pepper and red pepper. Let simmer on the stove for at least an hour. Remove from heat and let cool. Pour sauce into a food processor and pulse until pretty smooth. Return the sauce to the pan and add basil, mascarpone and parmesan cheese. Let simmer for about 20 minutes and ready to go! Serve over a nice breaded, fried eggplant or simply over pasta. This is a great recipe if you have leftover chicken too!!!! You could use turkey too!! Season chicken with rosemary, thyme, salt and pepper. Place on a baking sheet and broil for 5 minutes a side. 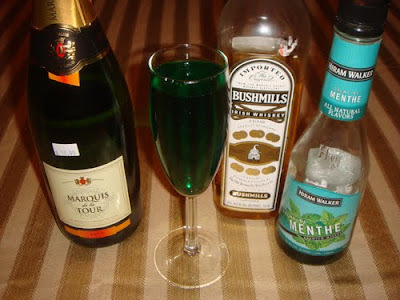 FRIDAY COCKTAIL - MINTY IRISHMAN!!!! 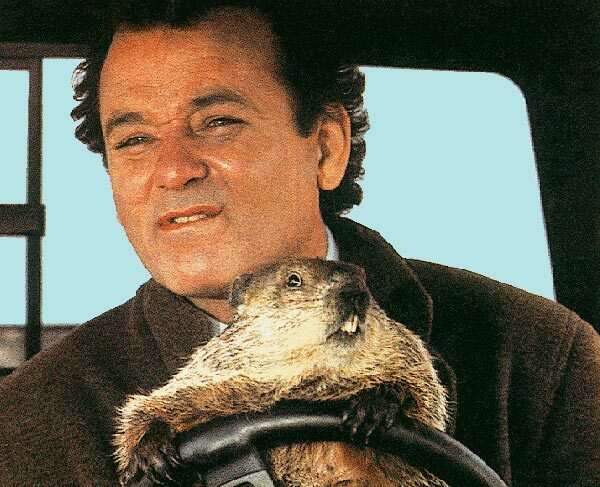 Let's move on from Valentine's Day and "prime the pumps" as it were, for St. Patrick's Day. If you enjoy a minty treat, here's a great GREEN one! And as you raise the glass just remember the official toast in Ireland is "slainte" which means "To Your Health"!!!! CHICKEN TORTILLA SOUP - EASY! 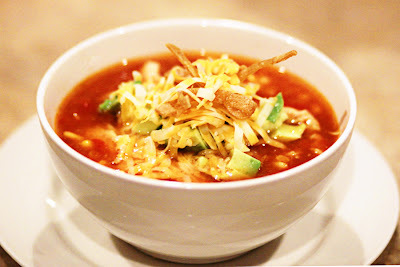 Well it is 60 degrees here....haven't seen that in months...got the windows and doors open....BUT we all know winter hasn't completely left us and some night we will want a nice hot bowl of soup...and this one is so easy and quick ....like 15 minutes quick. In a saute pan heat oil over medium heat and add tortilla strips. Cook until crisp and drain on paper towel. In a saucepan, combine salsa and broth and bring to a boil. Add chicken, corn and zucchini and heat through. Ladle into soup bowls and top with tortilla strips and garnish with sour cream, cilantro and lime. More kinda WRAP things! This is an easy 5 ingredient dish that takes about 15 minutes to make. 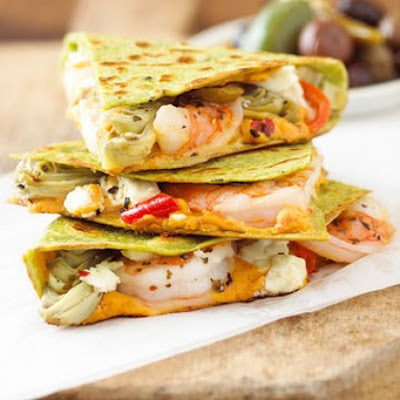 It takes the traditional quesadilla and kicks it WAY up! Each quesadilla is about 430 calories so the goodness feels great too. Coat one side on each tortilla with cooking spray. Place tortillas coated side down on a cutting board. Spread some hummus on each and top with shrimp, artichokes and cheese. Fold tortillas in half and press lightly. Heat a griddle on medium heat. Cook quesadillas for about 4-6 minutes turning once halfway through the cooking process. I always seem to order wraps when I got out to lunch but never seem to make them at home. Maybe it's because I spent 20 years making my son quesadillas..almost daily....but even he has moved on. 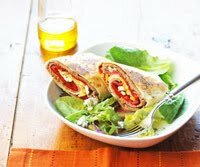 These are really good with the roast beef and blue cheese melted, add a side salad and you have a complete meal. You could certainly substitute sliced chicken or turkey. In a small bowl mix together mayonnaise and thyme. Reserve 1 tbl of this in a separate bowl. Stir the mustard into the remaining mayonnaise-thyme mixture. Spread some mayonnaise- mustard on one side of each tortilla. Divide roast beef, peppers and blue cheese on each tortilla. 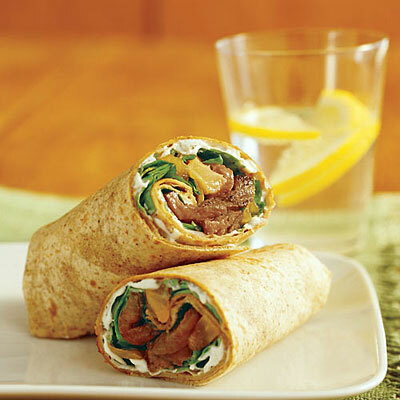 Roll up the tortillas and brush the outside of each wrap with the mayonnaise-thyme mixture. In a large saute pan lightly brown both sides of each wrap, cut each in half and serve warm. 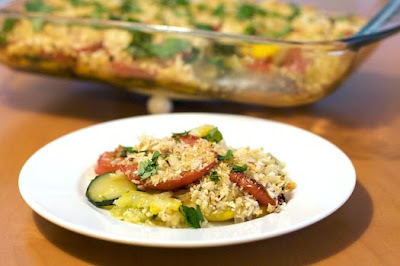 Again a nice side salad and you have DINNER in about 20 minutes! ONLY 400 CALORIES PER WRAP! Happy Valentine's Day!!!! No more glorious couple than Scarlet O'Hara and Rhett Butler. So on this Valentine's Day I will give you both recipes. They are both made with Southern Comfort - of course!!! Pour all ingredients in a shaker with ice. 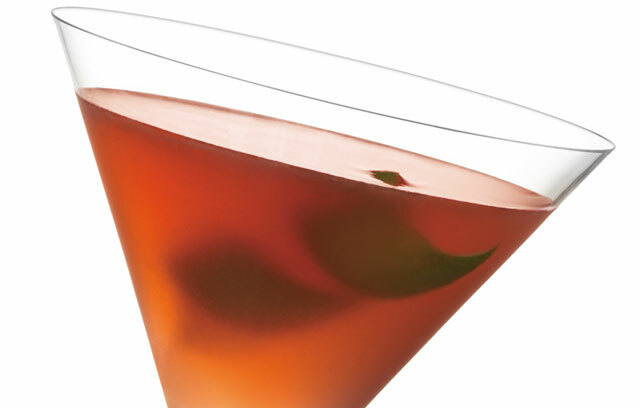 Shake and strain into a martini glass and garnish with a lime wedge. Pour all ingredients into a shaker with ice. 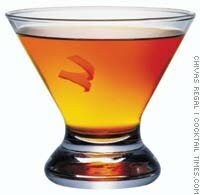 Shake and strain into a cocktail glass and garnish with a lemon twist. THEY'LL BE GONE WITH THE WIND! Got to be quick..off to a black tie charity event...hope my husband buys me something sweet (not this kinda sweet) at the silent auction!!! Whisk together flour, cocoa, baking soda and 1/2 tsp salt in a medium bowl. Stir butter and next 5 ingredients in another medium bowl until smooth. Stir in flour mixture then nuts. Cover and chill until firm at least 4 hours. This can be made a day ahead but keep chilled. Place one oven rack in top third of oven and one at bottom third. Line baking sheets with parchment paper. Roll 2 tbl fulls of dough to form balls and place on baking sheet. Flatten a bit. Bake two pans for 8-10 minutes and reverse their place on the racks both top and bottom about half way through the cooking process. Move cookies to a rack to cool. Meanwhile melt chocolate chips in the microwave and drizzle the chocolate over the cookies....oh my.....and let cool for about 30 minutes. The sugar rimmed glass - YUM...a mix of sour and tart in the cocktail..YUM...this one can easily make you reach the "one too many" mark and blush as pink as the drink. Rub the lemon on the rim of a martini glass. Dip the rim of the glass into a plate with the sugar and coat the whole rim. Set aside. Pour liqueur, vodka and juice in a cocktail shaker with ice and shake. Strain into martini glass and garnish with mint sprig! The man in your life will LOVE YOU so much if you make this for Valentines. Another great Bon Appetit recipe, it incorporates a lot of his favorite things..Beer, Kahlua and Ice Cream...did I mention BEER! I think I may even like these. Weird that I don't like chocolate except in chocolate ice cream. 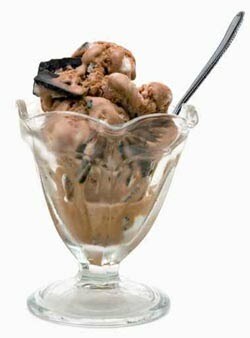 The cocoa syrup can be made ahead, 2-3 days, and chilled which may help keep it cold and the ice cream from melting. For the Cocoa Syrup, whisk together sugar, cocoa powder and a pinch of salt in a sauce pan. Pour just enough of the boiling water in to form a smooth paste (3 tbl) and then whisk in the remaining water. Simmer syrup for 1-1/2 minutes. Remove from heat and add vanilla. Cool to room temperature then cover and chill at least a few hours. To make the floats, using an electric mixer, beat cream and vanilla until peaks form. Cover and chill about an hour. Pour 1 tbl of Kahlua and 1 tbl cocoa syrup in the bottom of a tall 10 oz glass. Place a LARGE scoop of ice cream over that. Add beer pouring gently down the side of the glass to prevent foaming - all the way to the TOP. Spoon a dollop of whipped cream on top and drizzle that with a little cocoa syrup. Should make 6 servings...or in my case 2...Serve Immediately! A PERFECT GROWN UP DESSERT! Valentine's Day...well my husband and I don't celebrate it...think it's a bit foolish....and I don't eat desserts so this is a tough blogging time for me.....so I have asked for help today from Bon-Appetit Magazine. 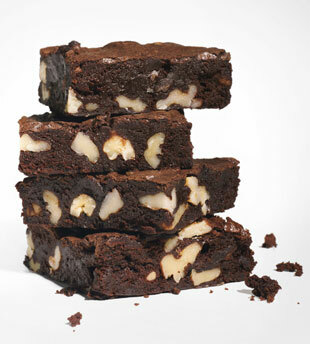 My husband and kids love brownies. I cheat and make them from the likes of Betty Crocker or Duncan Hines boxes, but this recipe seems like a true winner and it is Bon Appetit's Best Ever!!!!! 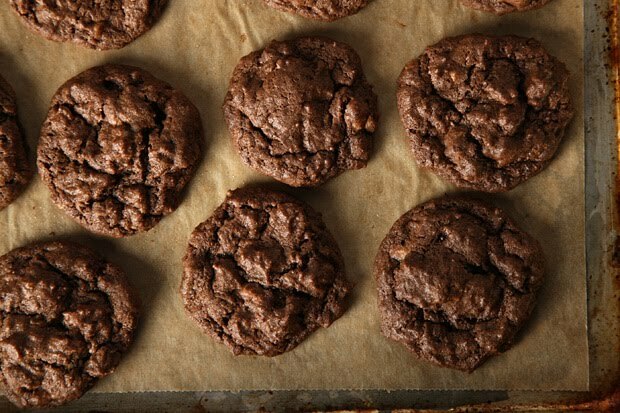 Described as the best ever - fudgy in the middle and chewy on the outside with a shiny crackly top.....sounds great to me! Position oven rack to bottom third of the oven. Line an 8 x 8 baking dish with tin foil pressing firmly along the sides and leaving a 2 inch overhang. Coat the foil with non-stick spray. Melt butter in a sauce pan over medium heat. Continue cooking until the butter stops foaming and browned bits form at the bottom, stirring frequently. Remove from heat and immediately add sugar, cocoa, 2 tsp water, vanilla and 1/4 tsp salt. Stir to blend. Let cool 5 minutes, but it will still be hot. Add eggs to mixture one at a time beating vigorously to blend after each one. When it looks shiny and thick add flour and stir until blended Beat vigorously for 60 strokes. Stir in nuts. Transfer to coated dish. Bake until toothpick inserted in the center comes out almost clean about 25 minutes. There can be crumbs on the pick. Cool on a rack. Using the foil overhang lift the brownies out of the pan. Cut into 4 strips and each strip to 4 brownies. They can be made 2 days ahead and stored in an airtight container. Healthy and Scrumptious! We know how good zucchini and tomato are for us and with the additions of a little spicy Italian sausage, some marinara and cheese...it's delicious!!! You could add or substitute eggplant or other vegetables as you like. On a baking sheet spread out tomatoes and zucchini. Salt and pepper them. In a saute pan melt butter. Add breadcrumbs and toast until golden brown. Set aside. Remove sausage from casing and cook until done and break into small pieces. Drain on paper towel. In a 8 X 8 baking dish, spread a layer of marinara sauce. Add a layer of zucchini, then breadcrumbs, sausage, tomato, artichoke, marinara sauce, sprinkle of Fontina and parmesan cheeses. Repeat until ingredients are gone. Top with a layer of marinara and cheeses. Bake in a 350 degree oven for 20 minutes until vegetables are cooked, cheese melted and sauce bubbling. I serve this with just some crusty bread. I know it seems odd that I would even MAKE meatloaf. I don't eat much beef as it is...and when I do it usually comes in the form of a beautiful medium rare filet mignon with asparagus and hollandaise.....at about a cost at Morton's of $45...haha..if you want to splurge with this recipe you can cut down on the beef and add ground veal. Heat oil in a pan and add peppers, shallot, garlic, red pepper flake, oregano, parsley and thyme. Season with salt and pepper. Saute until the vegetables are very soft. Remove from heat and let cool. In a bowl add meats and eggs. To that add the cooled vegetable mixture, panko breadcrumbs, parmesan cheese, 1/2 cup ketchup and 2 tbl balsamic vinegar. Season with a little salt and pepperUsing your hands, get all the ingredients combined. In a 13 x 9 greased with cooking spray, add the meat and form into a loaf. Whisk together remaining 1 cup of ketchup, 1/4 cup balsamic vinegar and Worcestershire. 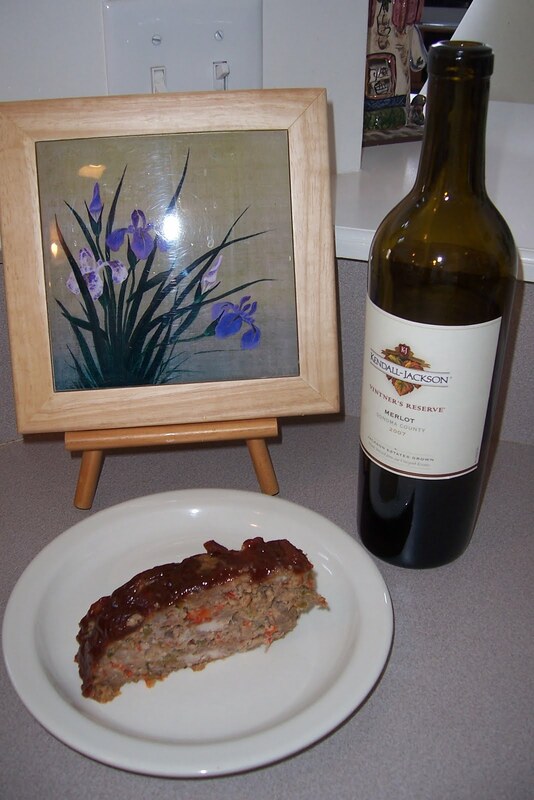 Brush it all over the meatloaf - sides and all. Bake at 375 for 1 hour and 20 minutes or until internal temperature is 160 degrees. Let rest for 15 minutes and serve. I serve with baked potatoes but you can make mashed or whatever your choice. Melt butter in a sauce pan and add garlic and shallot. Saute for about 8 minutes. Add the flour to incorporate. Add milk and cook until sauce thickens. Add cheese and stir until it melts. Add the remaining ingredients and heat through. Serve with tortilla chips. SUPER BOWL PACKERS COCKTAIL - PACKERS PUNCH! Apparently according to the internet world - this is the Packer's Lucky Charm ..... whatever!!!!!.. Just show up and play the game and you will win!!!! I will say..it's Green and Tasty!!! 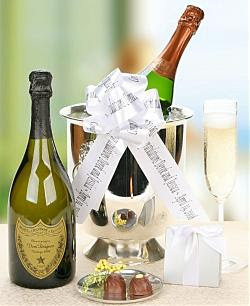 Okay...Okay..all you Packer fans..tomorrow it will be your cocktail turn! This is a little twist on a classic!!! A classic, by the way, that I ADORE! 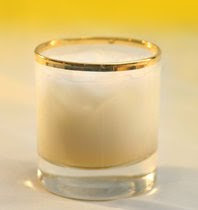 The White Russian!!!!! Combine the vodka, Kahlua and cream with ice and stir well. Then float the Galliano by pouring it over the back of a spoon into the glass. If only we were all in Hawaii after all this cold and snow. This recipe counts on the marinade. So if there are other flavors you think you would like in this...GO FOR IT! I serve this with some nice brown rice with a little fresh Italian parsley garnish. A combination of red and yellow peppers sauteed with a little marinade on them would be a great addition. 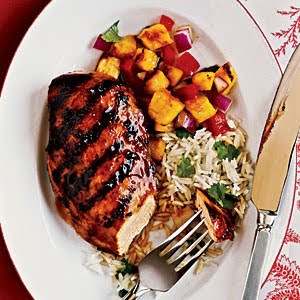 This recipe requires the chicken to marinade for at least 4 hours but can certainly go longer. You could marinade before you leave for work and all you have to do when you get home is make rice and saute the chicken...20 minutes!!!!! Combine first 7 ingredients. Reserve 1/2 cup marinade and pour remaining marinade in ziploc plastic bag. Add the chicken to the bag and swish it around and chill for at least 4 hours up to 12 hours. Heat a grill pan over medium-high heat and spray with cooking spray. Remove chicken from bag and through the bag out with marinade. Salt and pepper the chicken and add to the pan. Baste with 2 tbl reserved marinade. Cook total time is about 6-7 minutes turning once and basting with 2 more tbl marinade. Serve with rice. Fill a shaker with ice and serve as shots...newspaper says serves 10....I am going with 5....!!!!! You May Even Forget It's Still Winter! This couldn't be easier and more delicious. I love coconut chicken and shrimp. 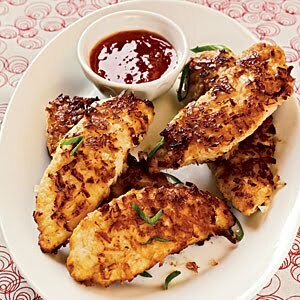 For this recipe you want to use boneless chicken breasts cut into 1/2 in strips. This is very affordable too and kids love them. I just buy a prepared mango-type salsa..but many store products would work depending on your taste....chili sauce, corn salsa, etc. Sprinkle chicken with salt, pepper and lime zest toss to coat. Create a breading station by pouring flour in a shallow plate, combining buttermilk and egg in a shallow dish and place coconut in a separate plate. Dredge chicken in flour and shake off excess, dredge in egg mixture and dredge in coconut. Heat large saute pan with oil on medium-high heat. Add chicken to pan when hot and cook about 6-7 minutes until done turning once in the process. Drain and serve immediately with your choice of sauce. 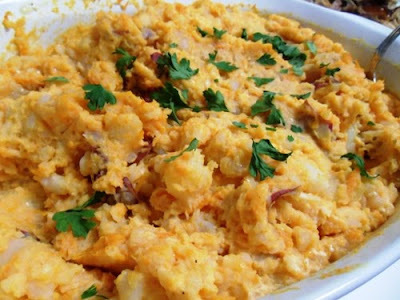 Makes an excellent appetizer or a main course with a salad or rice.